Leather, hand tooled Bicentennial purse with a red, white, and blue body and 30” red carrying strap. 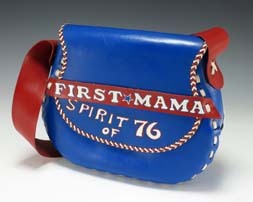 The front reads, “First Mama” and “Spirit of 76.” The reverse says, “Betty Ford” above the official Bicentennial logo. Mailed to First Lady Betty Ford as a Bicentennial gift.